Home » Actions » A Plea for Toilets in the LRT Stations. 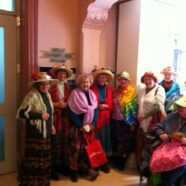 The Ottawa Raging Grannies came out in numbers to a meeting of the City Environment Committee where the budget was being discussed. Our purpose was to sing in favour of public toilets in the new LRT stations. We are concerned with the cost of retrofitting the LRT stations with toilets, since it is much cheaper to do it right the first time. Granny Linda Green adds, “The LRT end stations are not the only ones that need toilets. I might be in transit for up to an hour before I arrive at a LRT station such as Hurdman by bus. Then what do I do?” Failing to plan and budget for toilets in the LRT would be a serious, and costly, error. We said all that and we said it in song! Check out the video. Check out the words.